Sept. 23 John Ward and Ann Skinneen; wit. Eugene Smith and Mary Catherine Skineen J. Monahan. This entry was posted on October 21, 2010 at 1:02 pm	and is filed under Books & Media. Tagged: Chapel Hill, Church, News Clip, People, Social. You can follow any responses to this entry through the RSS 2.0 feed. You can leave a response, or trackback from your own site. 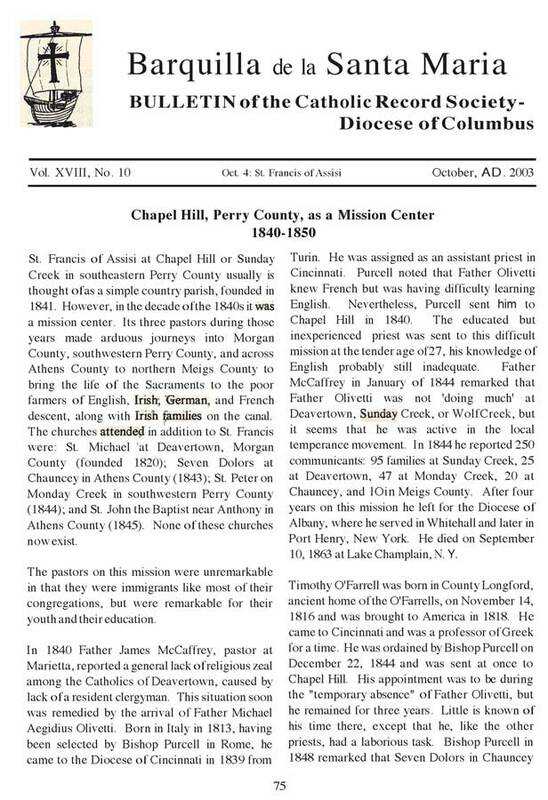 I am ooking for the framily of MIchael Mallen who married Alice Murtagh around 1841 in Chapel Hill, Ohio, both born in Ireland. They were the parents of 12 children, John, Mary, Ann, Catherine, Martha, Louisa, Frances, Bernard, Henry, Michael jr, and Alice. All born in Chapel H8ill between 1842 and 1867. looking for any record on this family, birth deeath baptismal, marriage. All help will be apopreciated. Please respond to me if this page is still alive. Hello Michele, we are starting to get things moving again on the page.